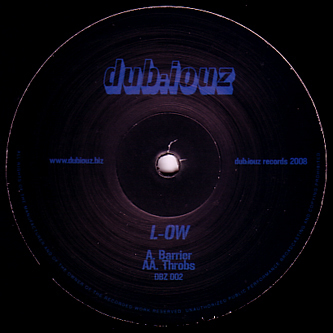 Robust dubstep rave DJ tools from L-ow for Dub:iouz records second outing. A-side 'Barrier' is built for proper soundsystem annihilation with brick hard snare/kick combos guiding a brutal bassline through it's paces, and 'Throbs' on the B-side does just that, with a gloopy pulse of electro bass shot through a tough hard-steppers variation with killer rimshots to make you dance better. DJ's into the tougher stuff like TRG, Breakage or Headhunter should be peeping this!